On March 16, the University of Maryland, Baltimore County pulled off the biggest upset in college basketball history, upsetting the University of Virginia 74-54 to become the first No. 16 seed to beat a No. 1 seed in the NCAA Men’s Division I Basketball tournament, a tournament accurately referred to as March Madness. 2018 marked the 80th edition of the NCAA Tournament, although the tournament field has only included 64 teams for the past 34 years. Prior to UMBC’s stunning upset, No. 16 seeds had lost all 135 games played against No. 1 seeds since the tournament field expanded in 1985. The qualification process for the tournament is a bit complicated. The tournament is technically comprised of 68 teams — all 32 Division I conference champions and 36 at-large bids. Although 68 teams make the official tournament field, four first-round “play-in” games decide the final matchups for the Round of 64, what most fans consider to be the true first round. The schools that make the round of 64 are divided into four regions with similar overall quality, meaning that each region has 16 teams. In each of the four regions, the best team — taking into account record, strength of schedule, and quality of wins and losses among other metrics — is seeded as the No.1 seed and the worst is given the No. 16 seed. In the round of 64, the No. 1 teams play the No. 16 teams, the No. 2 teams face off with the No. 15 teams and so on. Lower seeds (i.e., No. 16 teams) are almost exclusively “mid-major” conference champions, meaning they come from weak, low-budget conferences and qualify solely because they win their conference tournament. By contrast, higher seeds (i.e., No. 1 teams) tend to be larger schools from the Power Five (ACC, Pac-12, SEC, Big Ten, and Big 12) Conferences, as well as from historically strong conferences such as the Big East, the AAC, and the Atlantic 10, and they qualify for the tournament whether or not they win their conference. The UMBC-Virginia matchup followed this trend. UMBC, playing in only its second NCAA tournament in school history, sports a minuscule athletic budget of $9 million. The school competes in the America East, a conference with only eight NCAA tournament wins to its credit. 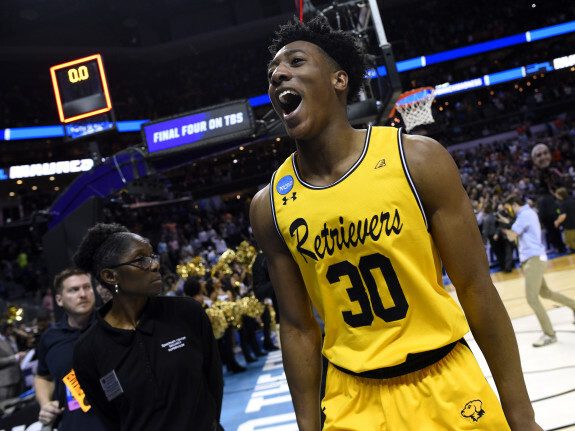 The only representative from Maryland in this year’s tournament, UMBC barely snuck into the tournament after upsetting Vermont, who dominated the America East regular season, 65-62 on a Jairus Lyles buzzer beater in the conference tournament final. On the other hand, University of Virginia competes in the Atlantic Coast Conference, a conference with 13 NCAA Division I men’s basketball titles to its credit. The school boasts an athletic budget of $100 million dollars and spends as much on basketball as UMBC’s entire athletic department. This year, Virginia notched an impressive 31-2 record in the highly competitive ACC and was ranked as the No. 1 overall seed going into the tournament after winning the conference’s regular season and tournament crowns. In fact, the school enjoyed a record-breaking season in conference play. In the highly competitive ACC, Virginia notched 17 wins and secured a 9-0 record in road games, two feats that had never been accomplished in the storied history of the conference. As impressive as these records are, they are not exactly surprising. Since Tony Bennett took over as coach of Virginia in 2009, he has led a resurgence of the program, transforming the team from an ACC bottom dweller into a Division I powerhouse. This season, Bennett led the team to its school-record fifth consecutive NCAA tournament and third No. 1 seed in five years. Unfortunately, Virginia’s regular season dominance under Bennett has not carried over to the stage where it matters most. Since 2009, Virginia has only made the Elite Eight once and has only twice made it out of the second round of the tournament. Some attribute these struggles to pressure, fatigue, and injuries, but, ultimately, no one knows why Virginia continues to lose to inferior competition in the tournament. “You know, it’s basketball. You’re not going . . . I mean, I don’t know why. I don’t know why, no. I guess we didn’t, maybe we didn’t come ready to play today. We didn’t shoot well. That definitely doesn’t help, but only to have five assists as a team is pretty bad, so I guess we didn’t move the ball well, didn’t shoot well. I don’t have the answers,” said sophomore guard Ty Jerome to reporters at a press conference after the UMBC game. Despite Virginia’s perennial tournament struggles, the ease of UMBC’s win was surprising. From 2009 to 2015, the school won a combined 41 games, only nine more than Virginia won in this year alone. However, the team has gained a newfound confidence under second-year coach Ryan Odom, winning at least 20 games in each of the last two seasons. The Retrievers were fearless prior to facing the best team in the country. “We had the confidence coming into the game. I don’t think there was any point in the game that we thought we couldn’t play with them. We knew we could play with them before the game,” said Lyles, a senior and star of the program in an post game interview. After sticking with Virginia during the first half and tying the score at 21-21 going into the break, UMBC grew into the game in the second half and eventually dominated, picking apart Virginia’s stellar defense at will. UMBC shot a steller 54 percent from the field over the course of the game, with Lyles scoring 28 points to lead the team. “They thoroughly outplayed us. Very hard to guard offensively, and they defended us well. We didn’t do the job,” remarked Bennett at the post game press conference. Coach Bennett, on the other hand, tried to look at the positives from Virginia’s season. “I told these guys in the locker room, we were cutting down nets at the ACC tournament and how good that felt. And we had a historic season, and then we had a historic loss, the first one seed to lose. That’s life,” said Bennett. While Virginia attempted to cope with the loss, UMBC was celebrating its historic win. UMBC sophomore forward Arkel Lamar, who notched a double-double in the victory, gave a profound statement to sum up the victory. Max '20 is from Berkeley, CA. Interested in pursuing a career in sustainable urban planning, Max has decided to double major in Environmental Studies and Economics. Apart from editing for The Phoenix, Max is a President's Sustainability Research Fellow, a member of the men's golf team, and a part of an environmental justice organization on campus called Serenity Soular. In his free time, Max enjoys playing basketball in the Fieldhouse and watching Love Island.